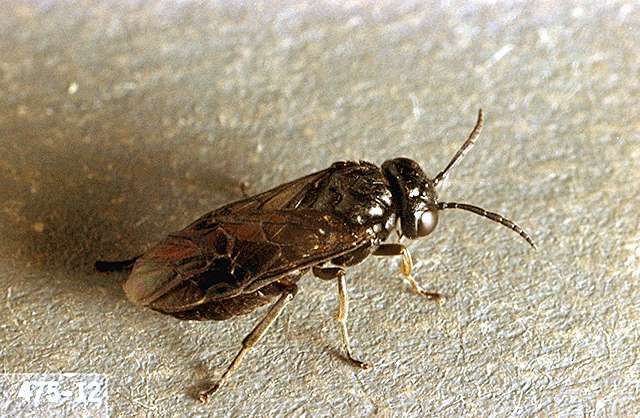 Pest description and crop damage The adult is a glossy black wasp, about 0.2 inch long. The larva initially resembles a small slug, due to the olive green slime that covers the body and the fact that the head is wider than the rest of the body. Mature larvae are 0.37-inch long and orange-yellow. Larvae feed on the upper surface of leaves, skeletonizing them. 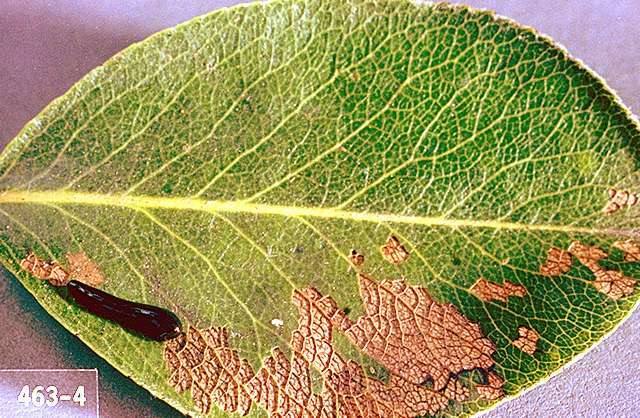 Heavy feeding causes leaf drop with reduction in vigor and yield, particularly on young trees. Biology and life history Cherry slug overwinters as a pupa in a cocoon 2 to 3 inches deep in the soil. Adults emerge over an extended period in late April to May. The adult female inserts eggs into leaf tissue, and eggs hatch in 10 to 15 days. Larvae immediately begin to feed on the upper surface of the leaf. After 3 to 4 weeks, they drop to the soil to pupate. Second generation adults emerge in July and larvae from this generation feed in August and September. Most larvae from this generation drop to the ground to overwinter. 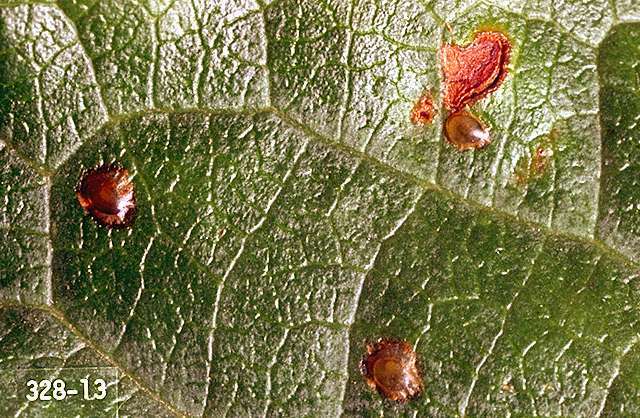 Pest monitoring Watch trees for the slug-like larvae in August and September when large populations can build up. Specific biocontrol agents are not known, but this is rarely a pest in backyard gardens, so significant biocontrol likely occurs most years. Home orchardists: Individual larvae can be picked off, or they can be washed off with a strong stream of water. kaolin clay (Surround at Home)-Repels some insect pests when applied as a spray to leaves, stems, and fruit. OMRI-listed for organic use. pyrethrin-Some formulations are OMRI-listed for organic use. carbaryl (Carbaryl 4L) at 2 quarts/a. REI 12 hr. PHI 3 days. Extremely toxic to aquatic invertebrates; avoid spray drift and runoff to surface waters. imidacloprid (Provado 1.6F) at 6.0 to 8.0 fl oz/a. REI 12 hr. PHI 0 days. Entrust SC at 4 to 8 oz/a. REI 4 hr. PHI 7 days. OMRI-listed for organic use. Success 2F at 4 to 8 fl oz/a. REI 4 hr. PHI 7 days. Results are best when applied at petal fall. May act slowly.